In Europe, the original coffeehouses were created to serve people coffee and provide a place for them to enjoy their drinks. As the coffeehouse evolved, it became an open center for thinkers and researchers across many disciplines to share their discoveries with one another. Public Coffee is specifically designed to generate this same type of collaboration and community engagement. 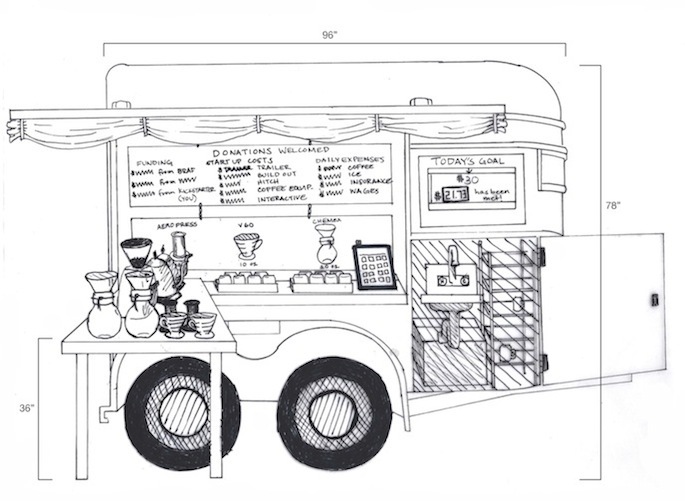 Public Coffee will be a mobile nonprofit coffee shop that visits neighborhoods across Denver, Colorado. Equipped with a participatory coffee bar and modular tables, the structure of Public Coffee is designed to facilitate collaborative and discursive involvement. By providing a space for interdisciplinary dialogue, Public Coffee aims to inspire a culture of tolerance and innovation wherever it goes, starting conversation and engaging locals.